Celebrate a birthday in style by presenting your gift with this Big Pink Happy Birthday Car Bow Ribbon. This Happy Birthday JumBow is Pink, but other colors are available. 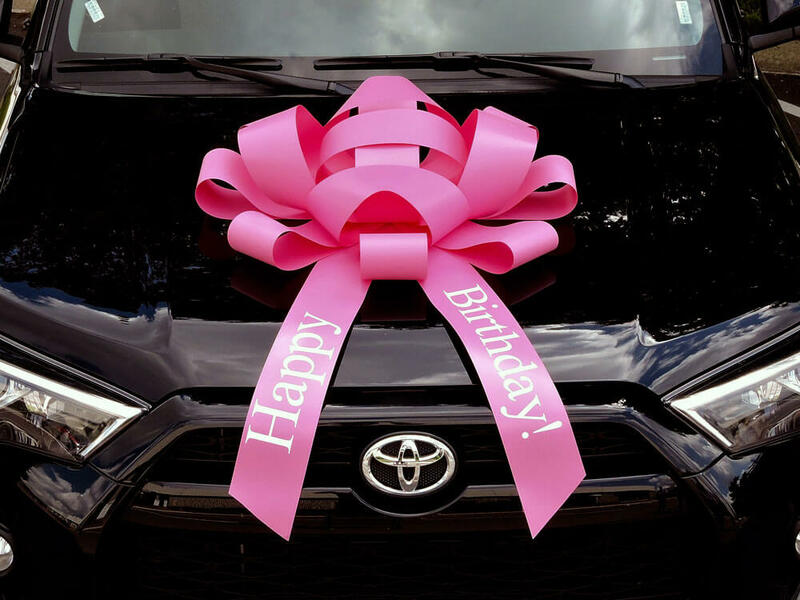 The Pink Happy Birthday Car Bow ribbon is the ultimate way to present the perfect birthday gift for a friend or loved one. Take their breath away by presenting their vehicle in style on their birthday, and make their big day extra special. This giant car bow comes with all the qualities that make all our car bows so great, including the durable vinyl material and scratch-free magnetic car bow backing, so order your large car bow today and say happy birthday properly. Make someone’s day by presenting their gift along with the Pink Happy Birthday Car Bow. We sell a huge range of car bows in every shape and style, so take a look at our other bows to see if you can find something else you like including our Graduation Car Bows, Suction Cup Car Bows, Holiday Car Bows, and the Original Big Red Car Bow. As soon as you place your order, we’ll send out your car bow in the mail with shipping options that arrive anywhere in the USA in between 1 and 5 days.